Our plastic web mesh range is manufactured to the highest quality. Dismantling and storing the plastic web netting is as easy as the installation, simply cut the ties and roll up the netting. Our plastic web mesh is available in blue, green, black and red. Our plastic web mesh range is manufactured to the highest quality. Fortress Fencing’s plastic web netting is based on a shade cloth construction with reinforced ridges to give it extra stability without the weight of wire chain link fence mesh. No wire also means reduced risk of cuts and lacerations, and significantly less weight. Fortress Fencing’s high quality plastic containment mesh is available in a convenient 10 metre roll and is perfect for enclosing small or large projects. It is quick and easy to fix to scaffolding, chain wire or temporary fencing and each roll measures 1.8m wide. It provides an effective visual barrier for increased privacy, as well as creating shade and protection in harsh environments. Our plastic web range of scaffold mesh is quickly installed, simply attached with tie wire, cable ties or clips and unroll, fastening as you go. It is lightweight and the compact roll means it can be managed by one person. Dismantling and storing the plastic web netting is as easy as the installation, simply cut the ties and roll up the netting. 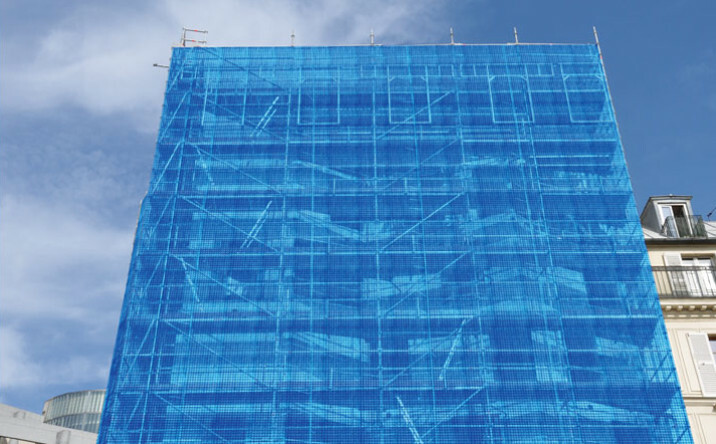 Our plastic scaffold mesh scaffold netting, also known as debris netting, guardrail netting, floor-to-ceiling debris netting or is available in blue, green, black and red. Fortress Fencing’s mesh is stable and strong, and complies with textile standards such as AS 2001.2.3.1-01; geotextile standards including AS 3706.4, and height safety standards such as AS 1891.1, as well as Queensland Workplace Health & Safety Regulations. Construction netting is an effective way to enclose your site. Used to create a wind barrier and control dust on construction projects, it reduces environmental impact on surrounding areas by containing debris within the confines of the site. Additionally, plastic web mesh can increase pedestrian and worker safety by protecting tools and equipment from falling.